Easy, this isn't my army, it's Fritz's over at Way of Saim-Hann. I thought it fitting that I use a picture of his army in this post since I started building my Vypers last night and now I've got a real appreciation for building fragile Edlar skimmers. I really envy you guys out there who have blogs that are focused one the one army you play. They make the perfect place to go and get all kinds of info on a force for someone like me. 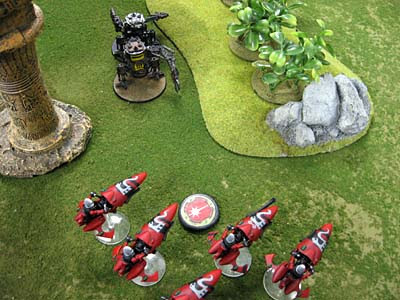 Check out Fritz's blog, it was the site that finally pushed me to try my hands at a non-marine 40k army. I've got my first 500 point game coming up on Thursady hopefully. We'll see how I do, expect a full report. UPDATE: I managed to get two small games in this past weekend. 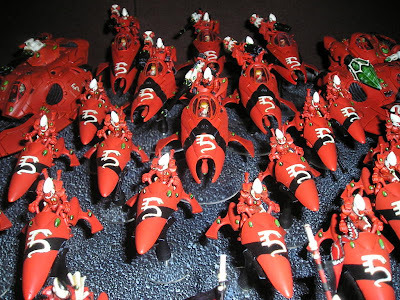 My thoughts on my new Saim-Hann army can be found here. Good luck in your game - let us know how it all goes down! Thanks, I won't have my Vypers painted but all my jetbikes are done... including my two small conversions.